It was about three years ago that I first started wondering more about my grandfather Isadore Goldschlager. I knew almost nothing about his life before he came to the US in 1904 from Iasi, Romania. I didn’t know too much about his life when he got to the US either. It was my interest in his life in particular that first prompted me to go on ancestry.com and start searching for answers. I soon hit a wall and gave up, only returning to ancestry a year later and starting my search for my Brotman relatives instead. Then I returned to my grandfather again, a somewhat more experienced researcher, and this time I had better luck. In fact, as I have written, I found not only his parents—I found his mother’s siblings Gustav and Tillie and Zusi Rosenzweig, and then I found their children and many of their grandchildren and great-grandchildren. I was able to piece together a better picture of my grandfather’s extended family and even figured out how he met my grandmother Gussie, who happened to be living down the street from his Rosenzweig cousins in 1915 on Pacific Street in Brooklyn. 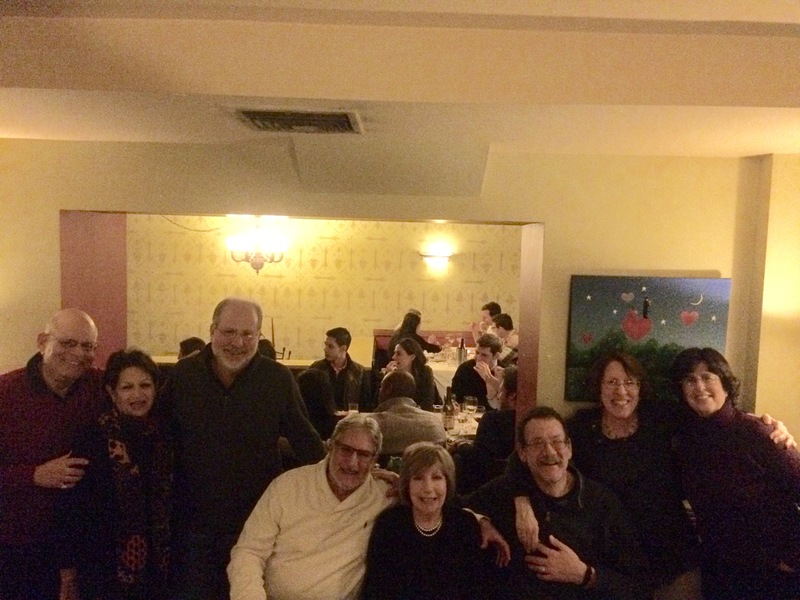 Last night I got to meet some of my Rosenzweig cousins for the very first time. Four of the great-great-grandchildren of David and Esther Rosenzweig were there—Gerry, Ron, Michael and me. 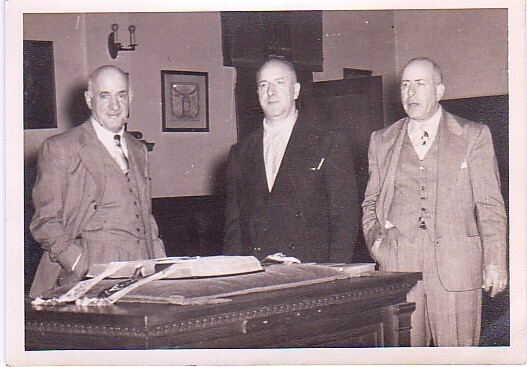 Gerry, Ron and Michael are all the great-grandsons of Gustave Rosenzweig, the brother of my great-grandmother Ghitla/Gussie Rosenzweig Goldschlager. Gerry is the grandson of Abraham Rosenzweig, and Michael and Ron are the grandsons of Joe Rosenzweig, the brother of Abraham. 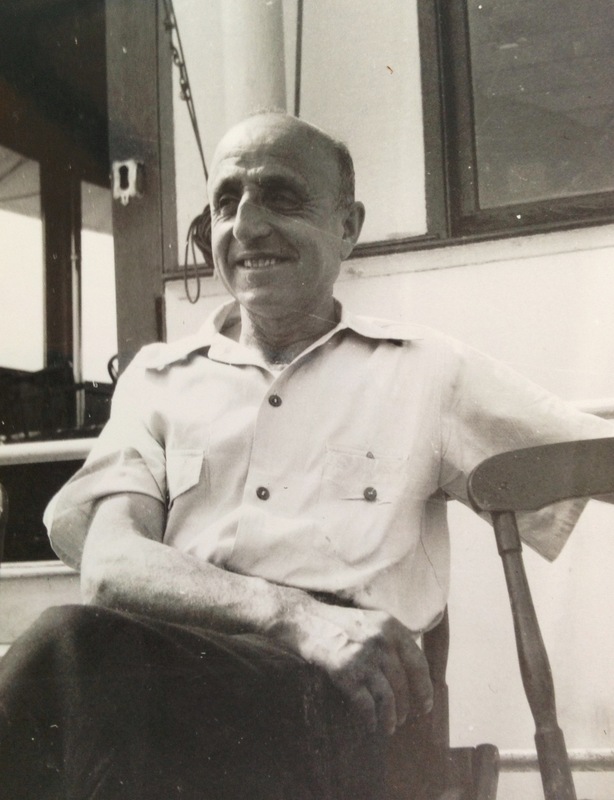 And here is a picture of their first cousin Isadore Goldschlager, my grandfather. It was a wonderful evening. Even though many of us had never, ever met before, we quickly connected and found common bonds—all having grown up in greater New York, all enjoying a good laugh, all loving dogs and our grandchildren (not in that order), and all being unable to digest raw onions. It was a great time, and even if we never knew each other as children, there was definitely a feeling of family. Here we all are with our spouses. Thanks to the lovely newlywed couple who not only put up with our noisy conversations, but also graciously offered to take this picture (on about five different smartphones). So keep looking for your cousins—you will never know how much joy you can experience. This entry was posted in Goldschlagers, New York, Rosenzweigs and tagged Brooklyn, Family, genealogy, goldschlager, Gustave Rosenzweig, New York City by Amy. Bookmark the permalink. What a wonderful post, well written of course, and all true! It was indeed, a wonderful evening and we’re all looking forward to the next time we will be together. Thanks, Ron. And yes, absolutely looking forward to being together again. Looks like a great time. I have been able to find a cousin here and there, so I can only guess how wonderful it would be to get together as you did. It truly was. So much fun! What a successful fine! Happy to see that you are enjoying every bit of your hard work. Good going Amy!! Thanks, Joann! I hope to get to Philadelphia after the winter to see the places where my ancestors lived and where they are buried. I hope to see you also! Hope all is well, and stay safe in the storm. You’re so right! I’ve found many cousins this way, and last fall i had the pleasure of meeting one, who travelled all the way from Alabama to Ottawa, Canada to see me. Wow! That’s impressive! I bet it was fun. It really was. She’s a delightful lady! Another “found cousin” situation was when I discovered that I’d actually known the fellow socially before I found out we were 3rd cousins. Genealogy is such a trip, isn’t it? Wow, that really happens? I keep wondering whether some old dear friend will end up being a cousin. Or even an acquaintance. Were you the person who blogged about some pet spray that helped your pets adjust to each other? I have a friend whose cats are not getting along, and I can’t remember the name of the product. I am! It’s called Pet-Ease, if memory serves. Terrific! Thanks—I will tell my friends!